This post is consequence of my week struggle with the Bulgarian Commercial Register‘s reckless breach of the Apostille Convention. Bulgaria has signed the Hague Convention Abolishing the Requirement for Legalisation for Foreign Public Documents (its official full name) and it is effective for Bulgaria since its adoption by the Bulgarian Pаrliament and promulgation in the state Gazette on 30.04.2001. Apostille’s purpose is to remove the bureaucracy when official document, issued in one signatory state is used in another signatory state. The state that issues the document, puts an apostille on the document, and this document shall be recognised without any further certification on the other state. This basic principle of simplifying paperwork should be followed by all countries that have signed the Aspostille Convention. One of our clients wanted to register a limited company in Bulgaria and start business as quickly as possible. He was unable to go to the Bulgarian embassy in London to certify the documents, because he was based in Scotland. 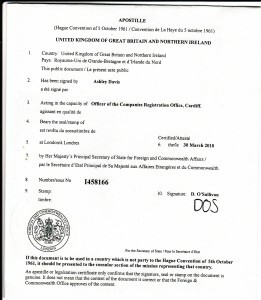 Therefore I suggested that he takes advantage of the legalisation procedures(apostille), provided in UK by the Foreign and Commonwealth Office. (2) The Ministry of Foreign Affairs, respectively “Consular department” may assign with a contract that translations are carried out by state, public, cooperative and private companies. This is the legal text that the Commercial Register requires the illegal additional certification. One of the most shocking facts is that this Regulation is obsolete as it was last amended in 1990 i.e. 11 years before Bulgaria actually adopted the Apostille Convention. It is obvious even to non-lawyers that the ‘no argument’ is totally irrelevant, so the only reasonable explanation for denying to accept the apostille as is might be illegal instructions by Agency’s HQ to collect fees by illegally requiring further apostille certifications. We have put our arguments many times (10+), but the registration clerks can’t follow even the relevant court practice. We have won many similar apostille rejection in court. Every such rejection to comply with the Apostille convention is overruled by the court after appeal. Nevertheless the Agency continues to illegally request additional apostille certifications. Following this confirmation that Bulgaria’s careless non-compliance with the convention is well known to the UK ambassador, I also wrote to the Bulgarian Ombudsman, Mr. Penchev, who is also a former chairman of the Supreme Administrative Court and a reputable judge, so hopefully my complaint is to be taken quite seriously. Current apostille problem affects many foreign businesses which invest in Bulgaria and this illegal practice is just a shame.